Now that the iPhone 6 has included NFC capabilities is there any plans to make the rings compatible with them? I think it would be awesome to expand your market to the apple world, but how likely is this to happen? There are a couple of discussions on that topic - the ball is in Apple's court. The rings are already compatible. NFC is locked up at present and only really useful for payments, this is an artificial limitation that Apple has placed on their product in order to promote their own payment method above other distractions. There may be a way through this via a jailbreak. But at this point I don't think anyone can say for sure. The only way to get Apple's attention and get them to change something is to be vocal about what you want. Reading the iFixit teardown: https://www.ifixit.com/Teardown/iPhone+6+Teardown/29213#s69255 it would appear that the iPhone 6 doesn't have the usual NFC flat coil antenna. This would make sense if it's just designed to emulate a card for Apple Pay rather than energise tags. I'm guessing that they chose this instead of a standard flat coil antenna due to the metal back - a standard coil antenna wouldn't work very well behind a metal plate. Given that it might be hard to energise a tag without such an antenna, I wouldn't put money on the NFC ring working if someone writes their own jailbroken app to drive the NFC chip, as the NFC ring is an order of magnitude harder to read than normal NFC tags (apparently this is a "feature" but it means I can't even use it with a case on my Nexus 7, and none of my other NFC readers can read it at all...). So it's much more likely that there's no NFC API simply because it wouldn't be that much use rather than any more fanciful reasons. Actually, that antenna looks like it should be a near perfect match with the nfc rings (assuming I'm looking at the right one and Apple have stuck to their usual antennas for phone and wifi). It makes sense to design it that way to compensate for the size of the antenna window they have there, and what you're assuming doesn't actually make sense - a credit card is much larger so if it can emulate that then here should be nothing holding it back except user access to the hardware. Can someone illustrate which part of the board they think is the NFC Antenna? Yeah nah man, that's the lcd screen. 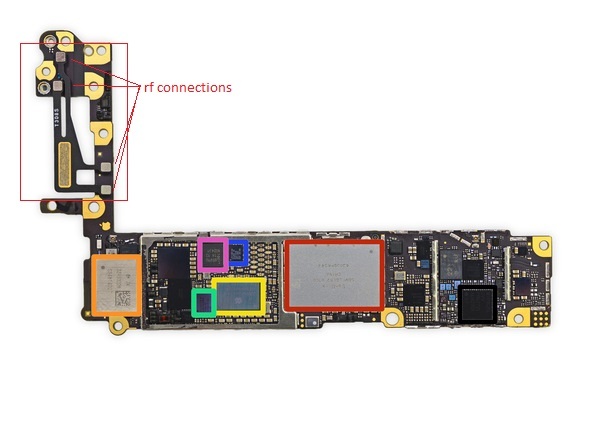 Look at the far left of the picture, antenna with 4 apparent connections to the logic board. Purple is nxp65v10, nfc module and secure element and to the bottom left of the green is an as3923 nfc booster IC which should be more than enough to get a small antenna like that rocking properly. AMS make some interesting stuff but they're most notable for their up to 1 watt NFC booster ICs with inbuilt antenna auto tuning. What this effectively means is that you can make your coil pretty much however you want it and the AS3923 will compensate an insane amount for a poor antenna design/implementation. Now I gather from your post that you got to the sub-heading. I'd like to point out that 'mobile payments' are a use of NFC technology, not a hardware type so much. AFAIK they will both do payments (anyone care to comment on that? I've never tried). IF the Apple would let you touch it's precious NFC unit with a third party app then I really can't see any reason why it would not work with a passive device like the NFC Ring. It's not a problem with the protocols because they're based on the NFC standard. It shouldn't be a power issue because of that IC which should compensate for the antenna and bring the power output up to an appropriate level. It shouldn't be a problem with the size of the NFC antenna because as long as it produces a strong enough RF field then there will be interaction with a passive device. Pretty much the only thing I can see that is stopping use with passive tags is the lack of access to the hardware from user space. That's not to say it's a definite, but I can't see why it should be impossible.